The memo was released by Fitch Ratings on Wednesday, acknowledging the budget and proposals still have to work their way through the legislative process. A copy of the memo was provided to The Midnight Sun today. Credit ratings and credit quality play a big factor in the ability of municipalities to issue bonds or borrow money. It says cuts to school funding would likely be met with increases to local property taxes at a time when the administration is seeking to funnel about $440 million in property taxes collected on oil and gas properties from municipalities to state coffers. The memo also examines Senate Bill 57, which would end bar local municipalities from collecting taxes on oil and gas revenue. It says that the North Slope Borough, which receives $372 million, would be the hardest hit with almost no other recourse. “Fitch believes the borough is unlikely to be able to reduce spending to match revenues available under the governor’s plan, and earnings on its large permanent fund (which equaled $708 million at the end of fiscal 2018) would be insufficient to replace the lost revenues on an ongoing basis,” explained the memo. It also notes that a larger review of the governor’s budget will be due at a later time. Fitch Ratings released an analysis of Dunleavy’s proposed constitutional amendments on Feb. 5, 2019 finding they “could result in negative pressure on the state’s long-term ‘AA’” rating. The long-shot proposals would enact a spending cap and require any changes to the PFD or taxes to be put up to the voters. “Fitch believes the enactment of these amendments, which require approval by two-thirds of each legislative chamber and a state-wide vote, could weaken assessments for key rating drivers related to budget control (i.e., independent legal ability to raise revenues, expenditure flexibility, financial resilience, and budget management), and therefore, exert pressure on the ‘AA’ IDR for the state,” it says. 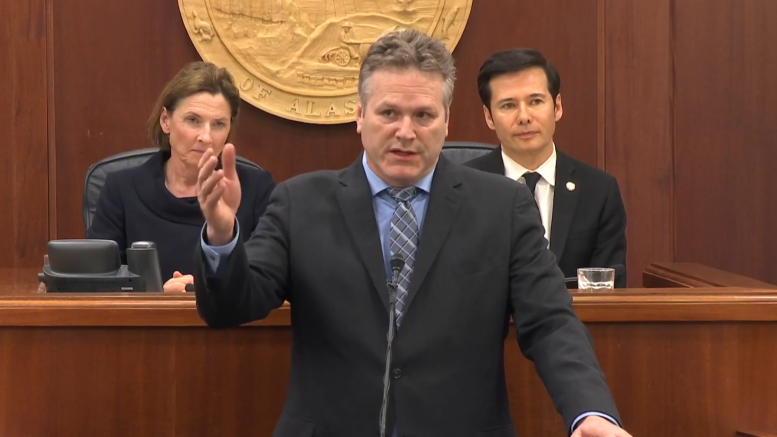 Be the first to comment on "Ratings agency says Dunleavy budget proposals could hurt credit of local governments"